The Malvales is an order o flouerin plants. As circumscribed bi APG II-seestem, the order includes aboot 6000 species athin 9 families. The order is placed in the eurosids II, that is pairt o the eudicots. The plants is maistly shrubs an trees; maist o its faimilies hae a cosmopolitan distribution in the tropics an subtropics, wi leemitit expansion intae temperate regions. An interestin distribution occurs in Madagascar, whaur three endemic faimilies o Malvales (Sphaerosepalaceae, Sarcolaenaceae an Diegodendraceae) occur. Mony species o Malvaceae sensu lato is kent for their wid, wi that o Ochroma (balsa) bein kent for its lichtness, an that o Tilia (lime, linden, or basswid) as a popular wid for carvin. Fruit o the cacao tree (Theobroma cacao) is uised as an ingredient for chocolate. Kola nuts (genus Cola) is notable for thair heich content o caffeine, an in past wur commonly uised for preparin o various cola drynks. 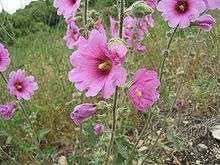 Ither weel-kent members o Malvales in the APG II sense are daphnes, hibiscus, hollyhocks, okra, baobab trees, cotton, an kapok. The morphology o Malvales is diverse, wi few common characteristics. Amang thaim, the maist commonly encountered is palmate leaves, connate sepals, an a specific structur an chemical composeetion o the seeds. The cortex is aften fibrous, built o saft phloem layers. This page wis last eeditit on 23 Dizember 2015, at 22:25.